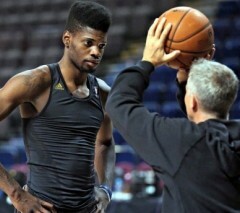 Believe it or not, 76ers big man Nerlens Noel has more going on right now than just rehabbing his knee and retooling his jump shot. Off the court Noel is making a few business moves and recently signed on as as an athlete advisor with CoachUp, a Boston-based organization that utilizes an online marketplace to match athletes with private coaches. Noel is the latest of a long line of Beantown area professional athletes who have joined the ranks of CoachUp to impart their wisdom. The 76er with the classic high top fade will be working alongside other stars on CoachUp’s Athlete Advisory Council such as former Red Sox’s outfielder Gabe Kapler (CoachUp investor) and legendary Boston Bruins player, turned team president Cam Neely. Noel benefitted from working with a personal coach at Tilton School in New Hampshire for his final two years of high school as well as during his time with Leo Papille’s AAU program, the Boston Amateur Basketball Club (BABC). Of course, it has been well publicized that Noel played on a BABC summer hoops circuit team with the Sixers’ reigning NBA Rookie of the Year, Michael Carter Williams. Noel who will make his 76ers debut at the Orlando Pro Summer League next month (7/5-11), appears to moving very well in the below CoachUp promotional video and in recent interviews has indicated that his knee is back to full health. When I look at the final standings, from last year’s Eastern Conference I still throw up in my mouth (just a little), but Noel’s solid health and his confident words above give me faith that this rebuilding process is going to take a step forward in 2014-15. Hopefully my faith isn’t misplaced.